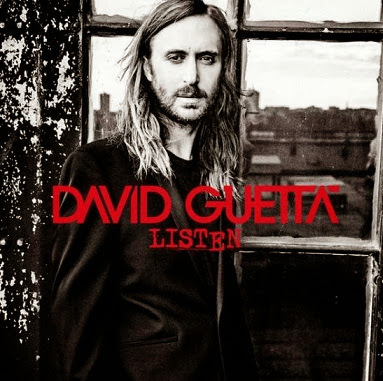 Established as one of the top names in the electronic music scene, David Guetta is about to release his highly anticipated new album "Listen", which promises to captivate new fans. The follow-up to "Nothing But The Beat" took three years to complete and features a new direction of the French DJ, who decided to take risks by changing his style of production, starting from Allied raids on vocals, and songs marked by investing in guitar and voice or piano and voice only after they were produced. "I could have chosen to repeat the style that has made me successful, but wanted to grow as a producer and push me to the limit. Try new ideas. Getting out of my comfort zone. Create songs that sustain played by a DJ, a band of rock or an orchestra. I worked with piano, violins, guitars and mixed with elements of electronic music. It's also my most personal work lyrically, which is why I called the album 'Listen'. It's also danceable, but it came straight from the heart" says Guetta. As expected, the album features guests artsts, like the English Emeli Sandé, who sings the verses of "What I Did For Love" from the band The Script, singer and songwriter John Legend, from Nicki Minaj in "Hey Mama" and again the Australian Sia, collaboration of hits "Titanium" and "She Wolf (Falling to Pieces)" and now features on tracks "The Whisperer" and "Bang My Head". The DJ also opened space for a name not known to the general public, the singer Sam Martin, responsible for the vocal on singles "Lovers On The Sun" and the latest "Dangerous" . 1. "Dangerous (Feat. Sam Martin)"
The drama imposed early on "Dangerous (Feat. Sam Martin)" serves as a cue for the fans know what to expect throughout the album. Despite having a pop sound, thanks to the vocals of Sam Martin, the track also features piano and violin and is a successful attempt to disengage DJ EDM pattern that dominates the market today. 2. "What I Did for Love (feat. Emeli Sandé)"
Lull by the sweet, unmistakable voice of British Emeli Sandé, this is an example of the "new" David Guetta. The song begins with a base of referring the best piano classics of Disco Music and is gaining body gradually, culminating in a beat that will not let anyone stopped on the tracks. The title repeated several times in the chorus also will make everyone sing together on the first hearing. 3. "No Money No Love (feat. Elliphant & Miss Dynamite)"
In "No Money No Love," Guetta experiences with electronic mixing reggae and ends up surprising again. At one point, the collaboration with Swedish rapper Elliphant and the British Miss Dynamite reminds the success of another collaborator DJ: Rihanna on the track " Where Have You Been ". However, just keep listening to find the inventive talent of the French. 4. "Lovers On The Sun (Feat. Sam Martin)"
The single "Lovers On The Sun (Feat. Sam Martin)", released some time ago, gives a break in the rhythm imposed by the previous track. As seen in the clip itself, the song is an unusual mix of electronics with the typical trail of westerns and could easily be the theme song of long directors like Robert Rodriguez and Quentin Tarantino. 5. "Goodbye Friend (feat. The Script)"
At the sounding of the first beat, the listener "Goodbye Friend" is transported to the intro of " Titanium (feat. Sia) "until the moment when Danny O'Donoghue begins to interpret the verses. With a letter that talks about overcoming and believe that things will improve, the song will also gradually increase to burst into dance Batidão. 6. "Lift Me Up (feat. Nico & Vinz, Ladysmith Black Mambazo)"
The duo Nico & Vinz lend their unique vocals and a positive vibe to this song, which also talks about keeping happy and not get depressed by others. "Lift Me Up" is one of those tracks that make the crowd raise their arms and jumping along to the beat while listening. 7. "Listen (feat. John Legend)"
The title track of the album is one that could very well be part of the soundtrack of a good story. Cradled by the pianos multitalented John Legend, Guetta proves once again that there is a collaborative let fail and no further, as you have not dance together. 8. "Bang My Head (feat. Sia)"
Who opens the second half of the album is Sia, Guetta partner in the two biggest hits of "Nothing But The Beat". Therefore, it is impossible not to compare "Bang My Head" with previous collaborations and in this case we can say that the track is an excellent "sequel" to "She Wolf (Falling to Pieces) (feat. Sia)", it also starts slower and explodes in a danceable chorus form. 9. "Yesterday (feat. Bebe Rexha)"
"Yesterday" is further proof of the generosity of Guetta, which opens space for American singer Bebe Rexha showcase her talent and steals the spotlight. At first listen, fans will not think they're listening to a track from the French DJ because its contribution turns out in a very subtle way compared to its most striking successes. However, at the end of the song it becomes clear that this is another demonstration of "out of the comfort zone" it was worth it. 10. "Hey Mama (feat. Nicki Minaj)"
Nicki Minaj , another longtime partner DJ, was climbing to pack "Hey Mama". Let me be clear that in no way resembles the song's success of Black Eyed Peas, but Minaj has a more singer and rapper least showing her Caribbean roots. Collaboration with Afrojack , "Hey Mama" has everything to be single and promises to become a radio hit. 11. "Sun Goes Down (feat. MAGIC! & Sonny Wilson)"
The collaboration with the singer of "Rude" and the Dutch singer Sonny Wilson is one with huge potential to be single. The track refers to the successes of the European summer, like " Summer Jam "from Underdog Project , yet can pack easily the best tracks in any season for many years ahead. 12. "STOP (feat. Ryan Tedder)"
Having the participation of hitmaker Ryan Tedder , leader of OneRepublic, it's easy to say that this song has almost guaranteed the possibility of becoming radio hit. Cradled by the unmistakable piano and vocals Tedder, "STOP" is ideal for that time of ballad when you are getting tired, but still finds early to get off track and can get dancing without spending energy that remains. 13. "I'll Keep Loving You (feat. Young Jaymes & Birdy)"
After "STOP" to dictate the pace, "I'll Keep Loving You 'follows slowing down to close the album. The duet from Jaymes Young & Birdy is almost a ballad which won a remix to play at parties without losing the essence of the original. Here, Guetta also proves that it is not just an icon of electronic music, but also a force in pop music. 14. "The Whisperer (feat. Sia)"
"Listen" is to show that is not only an outstanding record, but a testament to the all-rounder of Guetta, his initiative to experiment and take risks and know how to choose the most amazing collaborators to achieve the results he crave. The sixth studio album from French will be available from next Monday, November 24.